On August 5th, 2018 Nike released their 30th Anniversary “Just Do It” ad Campaign. Not afraid of controversy, Nike decided to implement one of the most controversial figures of contemporary American society, Colin Kaepernick. The former San Francisco 49’ers Quarterback brought much socio-political attention to himself when he refused to stand for the national anthem in 2016, instead deciding to taking a knee with a purpose to protest racial discrimination in America. The simple gesture sprouted an exponentially large dispute between the American people, as some saw Kaepernick’s actions as unpatriotic and disrespectful to US Military troops. Kaepernick and the NFL parted ways, as the league did not support the player’s strategic message. Now a free agent, Kaepernick and Nike have united to spread a message of resiliency and determination. Kaepernick jump-started the campaign by tweeting a picture that included the words, “believe in something. Even if it means sacrificing everything,” with Nike’s prolific slogan, “Just Do it,” hashtagged at the end. Of course this refers to Kaepernick’s kneeling and his refusal to back down despite being stripped from his football playing career. Kaepernick has found a new platform to convey his message and strong financial backing from Nike, however, this does not mean there isn’t a strong rejection of the now social activist’s message. Nike’s new relationship with the former player has introduced a “#NikeBoycott,” as people who disagree with Kaepernick’s message publicate their new hate towards the Nike brand by burning shoes and other mistreatments towards Nike products. One of my personal favourites is of a man who ingeniously burned his Nike shoes… while wearing them, burning his bare feet with them. 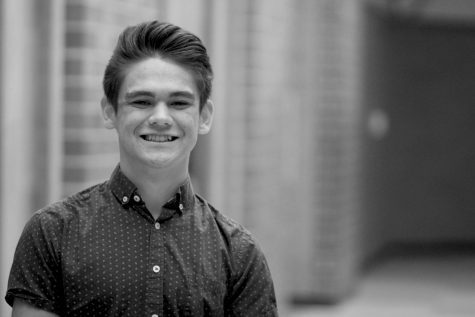 Not just people on social media, but other political figures such as Ben Shapiro have spoken out against the campaign. Kaitlin Bennett, the Kent State graduate who was so desperate for attention that she took her graduation pictures with a gigantic AR-10, is still frenzied for relevancy that she posted the same message but with one of her gun crazy graduation pictures, therefore making the argument about gun control. 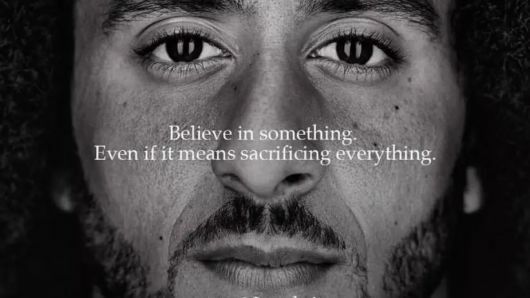 While of course, everyone has a different set of values, and interprets different forms of symbolic speech differently, personally, the Nike boycott for the sole cause of Kaepernick’s appearance on the ad is hypocritical, exaggerated and ignorant to the greater message of the ad campaign. The political side most related to the Nike Boycott and the overall disapproval of Kaepernick’s protest leans towards the right side of the political spectrum. The right who, when it comes to social issues, refer to the left as “snowflakes” for being too sensitive in certain socio-political situations, and commonly protest against a perceived “censorship of free speech,” have no space and look absolutely hypocritical rejecting and calling for the censorship of the the former player as well as exaggerated negative reaction towards his message. 5 minutes of Ben Shapiro’s 11 minute statement on Kaepernick and Nike did not have anything to do with the ad or the kneeling of the National Anthem but was a Shapiro ranting on how terrible Kaepernick was as a player. As if the former player’s ability to throw a ball in any way affects his ability to become a political activist. The main reason people have dissented Kaepernick’s kneeling of the National Anthem is they claim that the gesture is disrespectful to US Veterans and armed forces. This argument is still used in debate despite many veterans speaking out against the rejection of the player’s message. Many veterans back Kaepernick’s use of free speech, as they say that the protection of this right for Americans is what inspired them to join the armed forces in the first place. Actually, in the early stages of his protest, Kaepernick would sit instead of kneel but switched to kneeling as he did not want to disrespect veterans and other Americans in the armed forces. Two days after Kaepernick posted the controversial tweet introducing his involvement with this year’s “Just Do It” ad campaign, Nike posted the full “Just Do It” ad on their own twitter account. The two minute video conveys a message a perseverance and strength, as it displays the stories of individuals who have overcome great setbacks and disadvantages to become great athletes. While this message may apply to Kaepernick, the full Nike Ad introduces a culture that can apply to any skill, any challenge, any background, and any political ideology. It is a shame some are overlooking that valuable message because of one man’s political stance.